An easy-to-use, powerful and efficient compression and decompression tool. 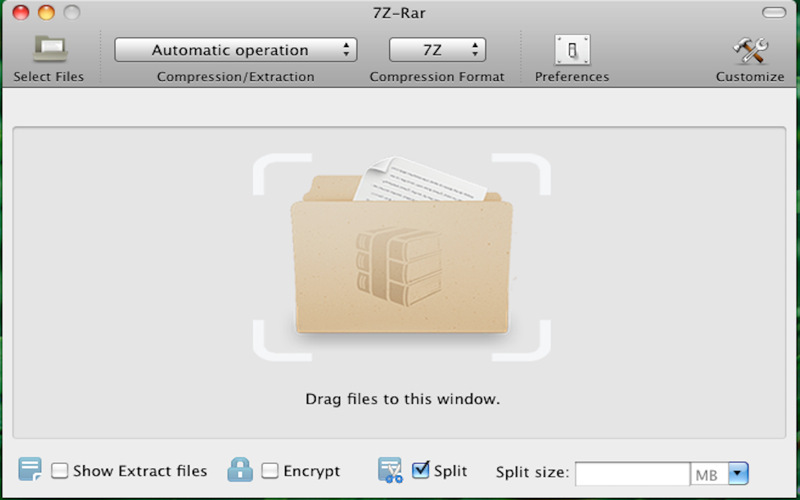 A much more capable replacement for "Archive Utility.app",7Z-Rar is designed to handle many more formats than Archive Utility, Supported file formats include RAR, 7z, ISO, CAB, Zip, Lzma, Tar, Gzip, Bzip2, EXE, PAX and many other more or less obscure formats. ● Opening a compressed package: You can drag a compressed package into the window or select a package directly from within the program through the file browser. You can decompress the package directly or browse the contents of the compressed package. ● Creating a compressed package: You can drag multiple documents or folders into the window, or select the documents or folders to be compressed in the file browser. ● Supports decompression of selected files. ● Protect your data: 7Z-Rar can create a password to protect your data. ● Supported compression levels: No compression, fastest compression, fast compression, normal compression, high compression, maximum compression.